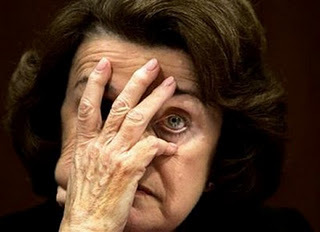 Dianne ‘Facepalm’ Feinstein has again deigned to address the Basked of Deplorables (TM) and the Deperately Demented Democrat voters. That makes twice in two weeks! What could it portend, faithful readers? What does it all mean? This time she was again on about her opposition to everything not out in left field. She’s against the Neil Gorsuch nomination. Check. We thought he was a good one, thanks for confirming it, Di. She’s against the repeal of Obamacare. Check. We already knew it was bad, but thanks anyhow. She’s against the GOP Ryancare bill. Check. Its bad, but not as bad as Obamacare. OK, got that. She’s against the nomination of David Friedman as Ambassador to Israel. Check. He must be OK, then. She’s for the humane treatment of Immigrant families. Hey! We are too. We just prefer to be humane to them before they immigrate crash our borders, mostly by not letting the US government blight their lives. Finally, she wants an investigation into the Russian fiddling in the 2016 US election. Check. Let’s see what Hillary was really up to, inquiring minds want to know. Because the Left just recently discovered that they don’t own the hearts and minds of most Americans. Because they just got their backsides handed to them at all levels in most of the nation. Because they feel the ability to successfully carry out a Socialist revolution slipping out of their grasp. Because it has been becoming clearer and clearer to more and more ordinary Americans that the Left’s agenda is a recipe for miserable failure. lBecause Donald Trump pulled their cover, and now they must destroy him. Because Donald Trump also showed that Conservatism, despite the feeble and spasmodic efforts of the would-be Conservative leadership, is far from a spent force in this country, and they are determined to destroy it. Because they are afraid that if we win we will do to them what they plan to do to us, and they must prevent that. So they’re pulling out all the stops, calling up even old, spavined war horses like Facepalm Feinstein to stave off defeat.